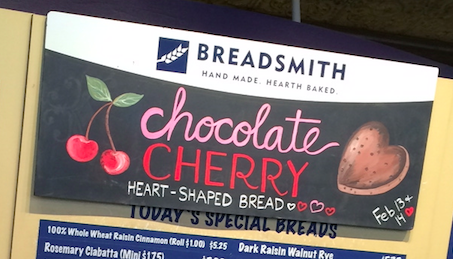 Heart-Shaped Chocolate Cherry Bread tops the list of chocolate goodies—and it's available now through Valentine's Day (while supplies last) at all three locations. Get one for your special someone. Other fresh-from-the-oven chocolate goodness includes our Chocolate Sugar Cookies, Chocolate Babka, and Chocolate Chocolate Chip Bread and Muffins. To keep your sweetheart warm this month, give Petite Maison Hot Chocolate (available in Rich and Dark or Peppermint). The hot chocolate is sweetly packaged in a European retro-look keepsake tin—perfect for storing love notes.